I see via the Wills, T & E blog that Sotheby’s has been accused of an undisclosed conflict of interest by Halsey Minor, the founder of CNET. The auction house allegedly did not disclose all the information it should have when it sold this work, The Peaceable Kingdom with the Leopard of Serenity, Edward Hicks (c. 1846-48). Halsey bought the work at a Sotheby’s auction last year for $9.6 million. Lee Rosenbaum and Donn Zaretsky covered the initial suit by Sotheby’s back in 2008. But now Halsey is claiming he was not informed that Sotheby’s was selling the work to recoup money owed by the previous owner of the painting, and the auction house had an undeclared interest in another work Minor bought, Childe Hassam’s Carriage in Winter. The dispute arose when Halsey refused to pay for these works and another and Sotheby’s brought suit. Halsey counter-sued asserting Sotheby’s conflict of interest, while Christie’s has argued it has a proper “security interest” in the works, but denies this rises to an ownership interest which it should have disclosed. The problem arises because Sotheby’s made itself appear as an impartial advisor, when in reality it was motivated to sell the works to pay off the debts it was owed by previous owners of a couple of these works. It seems Minor really relied on an employee of Sotheby’s, and she did not reveal the other interests in these works. As Zaretsky and Rosenbaum pointed out last year, both the New York Times and Bloomberg had revealed that Sotheby’s had an interest in the Hicks work. Which seemed to hurt his case of course. But if there was another interest in another work, that could change things. Konstantin Akinsha and Sylvia Hochfield report for ARTnews on the slew of Russian avant-garde paintings which were alleged to be fakes. An exhabition at the Château Museum in Tours, France was slated to exhibit 192 Russian avant-garde paintings was abruptly canceled in March, three days before its opening. Russian avant-garde is the body of modern art which was created roughly between 1890 and 1930. Pictured here is an authentic (I think) lithograph by El Lissitzky, Beat the white with the Red wedge (c. 1919). Fake icons and “fauxbergé” trinkets have bedeviled the art market for generations, but the escalating demand for Russian art in the last two decades has led to more ingenious abuses. For a while, “Russified” pictures—minor 19th-century European landscapes or portraits doctored to look Russian—flooded galleries and antique dealerships in Moscow and made their way to the West, appearing even at major auctions. But it has been Russian modernism—art from the first three decades of the 20th century—that has attracted the most Western collectors and consequently the most forgeries. Hundreds of works have appeared in recent years at auction houses and in galleries all over Europe, from Munich to Madrid. These works have very sketchy provenances in which certain assertions are repeated again and again: the works are said to have come from hitherto unknown private collections or to have been smuggled to Israel by immigrants in the ’70s or to have been deaccessioned by provincial museums in the former Soviet republics—although this practice was strictly forbidden—or to have been confiscated and hidden for a half century by the former KGB (the secret police), although experts say there is not a single documented case of avant-garde works emerging from KGB vaults. The means with which these forged works are given clean histories are familiar: publication in academic works or exhibition catalogs; previous owners who have suddenly disappeared or are unavailable to corroborate their story; questionable certification by Russian art historians, and a general lack of sufficient documentation. Again, it appears as if a segment of the art trade continues to skirt the rules. As I’ve argued elsewhere, we need a renewed emphasis on the means by which buyers of art acquire good faith status. The Art Loss Register—though not a cure-all for what ails the antiquities trade—is an invaluable tool for the recovery of stolen objects so long as they have been documented and reported. I have received a couple of press releases from the ALR highlighting recent recoveries of antiquities. Though it cannot help aid the recovery of antiquities which have never been documented, it can help in the recovery of stolen antiquities which have been documented and reported missing, underscoring the need I think for museums and nations of origin to do a better job documenting and reporting the stores of objects which they currently have. A couple recent seizures by Immigration and Customs Enforcement (ICE) highlight this. The panel, rectangular with a white background depicting a female minister, white wash on plaster with a modern wooden frame, was previously located at the excavation office in Pompeii and was reported stolen with five other fresco panels on June 26, 1997. The investigation revealed that, between 1903 and 1904, the Italian government authorized a farmer, Giuseppe De Martino, to restore his farmhouse, which was located on an archeological site in Boscoreale, province of Naples. During the restoration, six important frescos, originating from Pompeii were found. On July 12, 1957, the Government of Italy purchased the frescos. On June 26, 1997, after the completion of work to the excavation site, the Italian government observed that the six frescos were missing and subsequently reported the theft. The investigation received significant help from the Art Loss Register (ALR) of New York, an organization that maintains a database of stolen works of art. The ALR discovered the artifacts at the Manhattan auction house, which turned the artifacts over to the Register and ICE agents. One of the pieces recovered is a 7-inch-high depiction of a mummy with arms folded over the chest and hoes in each hand. It dates to between 1307 and 1070 B.C. 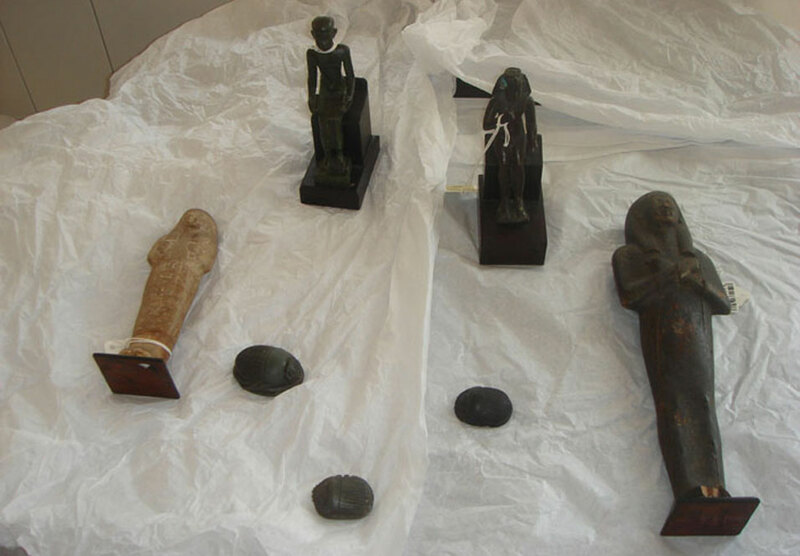 The other recovered artifacts were an bronze figure of Imhotep, artchitect of the first pyramid, and one of Hapokrates, and an Egyptian painted Wood Osiris, all dating as far back as 712 B.C. Gisela Bermann-Fischer waited almost 70 years to get back a painting by Camille Pissarro stolen from her family’s home in Vienna by the Gestapo in 1938. She recovered “Le Quai Malaquais, Printemps” after a quest that pitched her into a battle of lawyers’ letters with Bruno Lohse, a Nazi art dealer appointed by Hermann Goering to loot treasures in occupied France, and finally led to a Zurich bank vault, where the picture was stashed in a safe. Prosecutors sealed the safe as part of a continuing three-nation probe into associates of Lohse suspected of extortion and money-laundering. Now 80, Bermann-Fischer will auction the 1903 painting at Christie’s International’s sale of impressionist and modern art in London on June 23. Its value is estimated at between 900,000 pounds ($1.45 million) and 1.5 million pounds. Bermann-Fischer says it cost her at least 500,000 Swiss francs ($466,000) to recover the Pissarro, mainly in lawyers’ fees. At no point during her quest could she be sure of getting the artwork back. A couple interesting returns of objects, both of which which appear to be completely voluntary. An extremely valuable letter by Abraham Lincoln dated November 14, 1863 — missing from public records for maybe 100 years — has been donated today by a private collector to the National Archives. The brief note on Executive Mansion letterhead in the President’s handwriting signed “A.Lincoln” was sent to Treasury Secretary Salmon Chase. It was written five days before Lincoln delivered the Gettysburg Address, providing insight into the president’s regard for a personal friend and his interest in West Coast politics even in the midst of the Civil War. National Archivists discovered the Lincoln letter being sold online in 2006. It originally had been torn or fallen from an 1880 bound volume of government correspondence to the Treasury Department. There is no evidence that the letter was ever stolen, and how it went missing remains a mystery. When contacted by Archivists, the letter’s owner, Lawrence Cutler, a private collector in Tempe, Arizona decided to donate it during the bicentennial of Lincoln’s birthday. Cutler would not disclose what he paid for the letter at auction three years ago, but said a similar Lincoln letter sold for $78,000. Four sons of Horus, New Kingdom, 19th Dynasty or later after ca 1295 B.C. LONDON. Eton College, in the south of England, has returned more than 450 antiquities to Egypt, after it was realised that many had probably been illegally exported. Last month we reported that the main part of the school’s collection, bequeathed to the school by Major William Myers in 1899, is going on long-term loan to Birmingham University in the UK and Baltimore’s Johns Hopkins University in the US (The Art Newspaper, May 2009, p7). The returned antiquities had been donated to Eton over a century later, in 2006, by the family of the late Ron Davey, a London-based Egyptologist. He in turn had received most of them as a bequest from his friend, Peter Webb, who had died in 1992. When the antiquities arrived at Eton three years ago, they were examined by curator Dr Nicholas Reeves. The donation comprised 454 items, including ushabti figurines, beads and amulets, textile fragments, potsherds, coins and other small objects. Both the letter and the Egyptian antiquities do not seem to be terribly valuable, but the individual dealer and Eton College have both seemingly unilaterally decided to return the objects to their proper stewards. But one wonders if either the letter or the antiquities are particularly valuable or noteworthy. If they had been, would the decision to return them been more difficult? I think it probably would have been. John Varoli for Bloomberg has the story of this work, sold by Christie’s International for $3 million which may be a fake. The work, purportedly made to appear as a work by Boris Kustodiev is included in a list of 100 alleged fakes by Russian masters which have been sold over the past decade. For the past 18 months, Russia’s art market has faced its worst crisis of confidence in the post-Soviet era as five volumes of “The Catalog of Fraudulent Art Works” were published, said dealers. Some experts say that fakes now comprise the majority of artworks they are asked to evaluate. Prices have also tumbled as the financial crisis cuts collectors’ appetite for art. Combined sales at Russian art auctions in New York at Sotheby’s and Christie’s in April were about 40 percent of the volume sold in 2008. Rosokhran-Kultura, the government’s cultural watchdog, released the latest issue of the fakes catalog last month. It contained the most expensive item sold at Christie’s November 2005 auction of Russian paintings in London. It was listed as “Odalisque,” painted in 1919 by Kustodiev. “There’s no doubt ‘Odalisque’ is a fake, and that’s why we included it,” said the catalogue’s co-author Vladimir Roschin. Charles Stanish, Anthropology professor at UCLA makes some great arguments in the May/June issue of Archaeology magazine about the intersection of eBay and antiquities manufacturing. The piece, “Forging Ahead: Or how I learned to stop worrying and love eBay” argues the popular auction site is not as big a problem for the looting of ancient sites as many of us might believe. Instead, a number of forgeries have begun to flood the market. It is a terrific, and frightening article. It echoes an argument I’ve been trying to make in recent months: that the lack of transparency in the antiquities trade is defrauding our cultural heritage. Without an accurate and impartial accounting of an object’s history, how can we know for sure if an object is forged? The wealthier collector who up to now has been laughing about the naive folks who buy on eBay is in for a surprise, too: those dealers that provide private sales are some of the forgers’ best customers, knowingly or otherwise. In fact, the workshops reserve their “finest” pieces for collectors using the same backdoor channels as before, but now with a much higher profit margin because they are selling fakes. As a former curator myself, I know that an embarrassingly high percentage of objects in our museums are forgeries. What fools the curator also fools the collector. From the professional’s point of view, there are really three kinds of “antiquities” on eBay. About 30 percent are obvious fakes or tourist art that can be detected by looking at the pictures, even the fuzzy ones. These are easy to pick out because they are not intentional reproductions, but simple pieces manufactured for tourists and sold as such. The creators of these pieces mix up iconography and choose colors and shapes for visual effect. Such objects are clearly not ancient. Another five percent or so are probably real, while the rest are in the ambiguous category of “I would have to hold it in my hand to be able to make an informed decision.” This latter category has grown fast. This isn’t an isolated problem. Consider the Getty Kouros, the Bolton forgers, and the others we do not yet know about. Author Derek FinchamPosted on April 21, 2009 Categories AntiquitiesTags Auction, Forgery2 Comments on "What fools the curator also fools the collector"
Immigrations and Customs Enforcement Agents seized this work by an “unknown Utrecht master” dating from 1632. It will be returned to the Max Stern estate. In a piece by Catherine Hickley for Bloomberg, it is reported that the work was seized from Larry Steigrad on April 2nd. The precedent for the seizure was set late last year by the First Circuit Federal Court of Appeals in Vineberg v. Bissonnette. It affirmed summary judgment for successors of an art dealer—Max Stern who was forced into selling works under the Nazi regime. The sale took place at a 1937 auction; the First Circuit held in that case that the forced sales of works belonging to the Stern estate were a “de facto conficcation”, providing the precedent for this seizure. Thomas Kline, an attorney for the Stern estate is quoted in the piece “With that decision, all artworks Stern sold under orders at the Lempertz sale are now considered stolen property, [and the estate] “hopes to receive further assistance from law enforcement authorities in the U.S. and elsewhere”. Lawrence Steigrad, the owner of the gallery in Manhattan where the work was seized says in the piece ““I was in my warehouse in New Jersey when Philip Mould [the London dealer who sold him the work] called me on my cell phone . . . I was shocked and upset that we had not found out before we purchased this painting, as we both had it checked. We were both happy that I had not sold it on, causing more problems and involving private clients.” It seems a bit curious perhaps that this call came only a couple of days before an undercover agent walked into the gallery to look at the work. Loringhoven said London-based Art Loss Register carries out about 300,000 searches a year. “While we endeavor to be as thorough and as accurate as possible, we may miss a handful of items”. It seems then Mould is left footing the bill for this restitution at present; though he may choose to proceed perhaps against the Kunsthaus Lempertz or even the art loss register based on the details in the piece. The Department of Justice and Homeland Security will return the work to the Max Stern Estate today in a ceremony in New York today which is also Holocaust Remembrance Day. "Art isn’t reduced here to a litany of obscene auction prices"
Italy is not like America. Art isn’t reduced here to a litany of obscene auction prices or lamentations over the bursting bubble of shameless excess. It’s a matter of daily life, linking home and history. Italians don’t visit museums much, truth be told, because they already live in them and can’t live without them. The art world might retrieve a useful lesson from the rubble. Italy’s prime minister, Silvio Berlusconi, has been busily soliciting foreign aid for cultural restoration after the quake. More than 11,000 volunteers and rescue workers have rushed to help. Milko Morichetti is one, a 39-year-old art restorer from Mogliano, in the Italian Marches. Author Derek FinchamPosted on April 15, 2009 Categories UncategorizedTags Auction, ItalyLeave a comment on "Art isn’t reduced here to a litany of obscene auction prices"